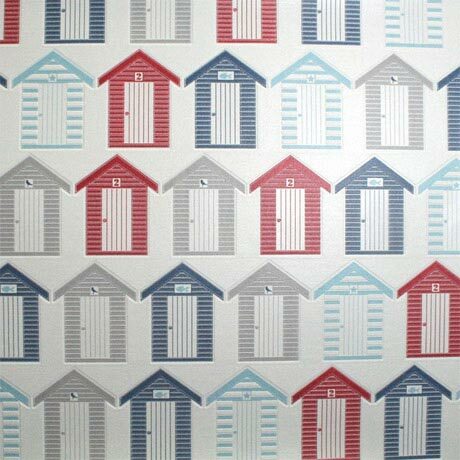 The Beside the seaside bathroom wallpaper from Graham & Brown, quirky and contemporary, our wonderful seaside design wallpaper features a motif of traditional beach huts in beautifully British red white and blue! This is a bright and summery design that brings colour and light to any room, but with its fun seaside theme and lively palette we think this would be the perfect choice for bathrooms or children’s play rooms. The antibacterial collection is a range of splash-proof, durable wallpapers ideal for kitchens and bathrooms as it provides 99.9% safe, long lasting protection against household bacteria such as MRSA, E.coli, Listeria and Salmonella. Very impressed with this wallpaper.